Social Forum Journey » December 12: speakers, backing from 462 organisations, and a System Change not Climate Change bloc! 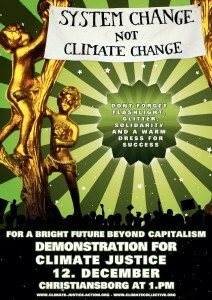 December 12: speakers, backing from 462 organisations, and a System Change not Climate Change bloc! The future is bright, if we make it so: to light up the darkness, bring lights, wear bright colours, bring glitter. Gather at the three trucks carrying the bloc’s banners. To find out who will speak at the demonstration is harder. There is no information at the official 09dec12 web site. Berlingske, the main conservative daily in Denmark have an extensive calender of very many activities and states that speakers will be: Mary Robinson, Rahul Bose, Helle Thorning-Schmidt, Villy Søvndal, Margrethe Vestager, Johanne Schmidt-Nielsen, Kumi Naidoo og Helen Caldicott. As it has been stated that there should be 12 speakers in total and half of them from the South this result shows a strong tendency in favour of celebrities and party leaders. Sofar none is representing a popular movement. The Social democrats and Socialist people’s Party both have their leaders speaking, The social liberal party the parliamentary leader and the Red Green Alliance an MP. Mary Robinson from Ireland and former UN human rights commissioner is honorary cahir of Oxfam. Helen Caldicott well known anti nuclear actvists. From the South already chosen are Kumi Kaidoo, chair of Greenpeace and earlier at CIVICUS, and Rahul Bose, a Bollywood actor. Which the popular movement or other speakers from the South will be seems not to have been announced yet.